A few months ago, Slack celebrated the third anniversary of its official launch. In that time, we’ve grown from 20 employees in two countries to nearly 800 employees across five countries. Since we last reported diversity data in February 2016, our global workforce has more than doubled. This year, our reporting format adheres to the Equal Employment Opportunity Commission’s approach. Reporting with EEOC standards is a legal requirement for us in the United States and also makes our reporting more consistent with other organizations providing similar reports. This means a different categorization of race and ethnicity than we have used in past reports, along with other differences in data collection methodology.¹ Other than gender, we have limited our reporting to United States-based employees in order to adhere to local laws in the other countries in which we operate. Globally, 43.5% of our workforce is comprised of women, unchanged from our last report in February 2016. 48.1% of our managers around the world are women, up from 43% last year. Women make up 29.8% of our Technical organization globally, up from 24.5%, last year. 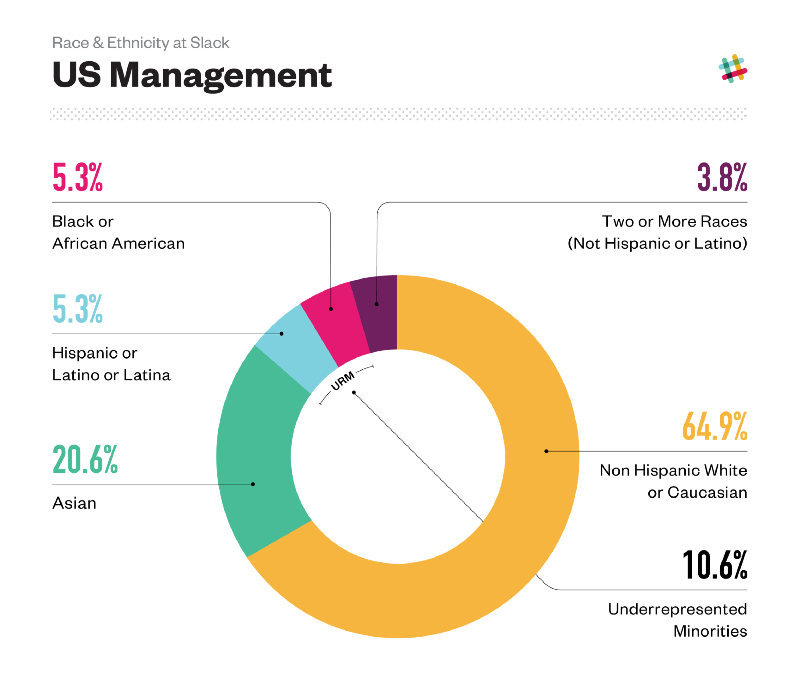 10.7% of our U.S. managers are from underrepresented racial and/or ethnic backgrounds. 11.4% of our U.S. Technical³ organization is comprised of people from underrepresented racial and/or ethnic groups. This year, we’ve looked at LGBTQ and disability status specifically among U.S. employees. 7.8% of our U.S. workforce and 7.6% of our U.S. managers identify as LGBTQ. 1.7% of our U.S. workforce identifies as having a disability. We have maintained pay equity between women and men since we began measuring more than a year ago, as confirmed by an independent third party. We also review promotion data every cycle, and we’ve found no statistically significant differences in nomination or actual promotion rates between men and women. Parity across both pay and promotion must go hand in hand if we want to build meaningful representation into our business as we grow. As part of this commitment, we were proud to sign on to the White House Pay Equity Pledge last year. We have no American Indian/Alaskan Natives in the U.S.
We have no Native Hawaiian/Pacific Islanders in U.S. Technical roles. We have no Native Hawaiian/Pacific Islanders in U.S. Management roles. Leadership includes all Director and above positions. We have no Native Hawaiian/Pacific Islanders in U.S. Leadership roles. 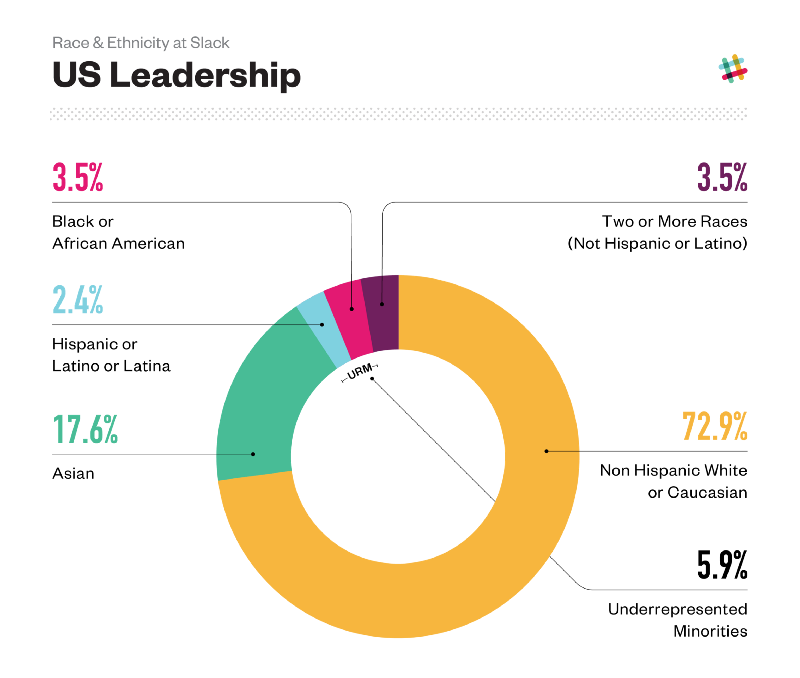 We remain committed to increasing representation of underrepresented minorities in the tech industry as a whole. Last year, we hired on two-thirds of our Code2040 interns full-time, and this year we will welcome five interns into our 2017 class. Our recruiting team sources underrepresented candidates for every new role, at every level in the organization. We emphasize diversity in gender, race/ethnicity, generation, sexual orientation, and ability through distributed job postings, recruiting events, and partnerships with orgs like Year Up. We’ve established recruiting captains for each of our employee resource groups — Abilities, LGBTQ, Earthtones, Women, and Veterans — to better understand and support them with events, referrals, and other recruiting support. In addition to these efforts, we are eager to find new ways to strengthen networks inside and outside the company to support underrepresented people, develop talent, and create a more inclusive environment as we grow. We are simultaneously proud of what our people have been able to accomplish so far and determined to improve. This is a work in progress. We have strong representation of women company wide and in technical roles. However, that representation, and representation of underrepresented racial and/or ethnic groups, declines at more senior levels in the organization. That means we need to cultivate future leaders from these groups over time, and do more to ensure our processes and workplace are fair and equal in opportunity. We’ve learned a lot over these last few years, but think of ourselves as very early in the process and anticipate much more experimentation and growth over the coming years. We look to partner with and learn from others who are pioneering innovative approaches in these areas, because the systemic obstacles to equality of opportunity are not going to be overcome by the work of any one organization. We recently committed to the next class of Project Include, where we will seek to understand best practices in advancing inclusive environments and reporting diversity data. In addition, as part of our commitment to Pledge 1%, we set aside 1% of the company’s equity to fund and support programs that advance people who have been traditionally underrepresented in the technology industry, including women. 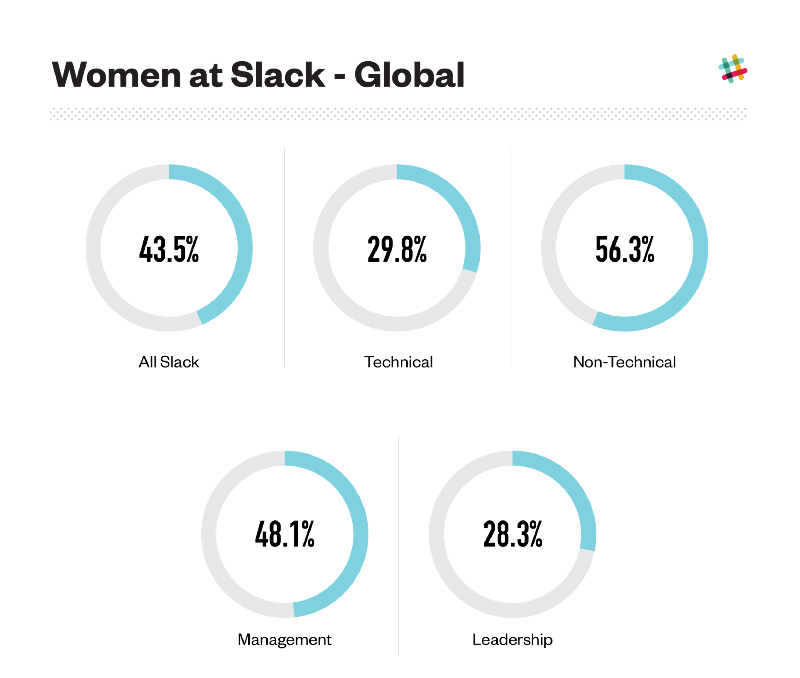 We have always said we want Slack to be a place where people of all different backgrounds thrive. This report is part of our commitment to the transparency required to make progress in this space. Ultimately, we would like to be the kind of company that could serve as an example of diversity and business success going hand-in-hand, and we’re committed to doing the work to get there. Last year we used an anonymous survey tool and expressed populations as a percentage of respondents, whereas this year information was tied to our HR database and populations were presented as a percentage of all employees, not just survey respondents. Last year we allowed respondents to select multiple options with which they identified and results were normalized to 100%, whereas this year it was only possible to select a single category, including a new category: Two or more races (Not Hispanic or Latino/Latina). As a result of these changes, some percentages can look quite different from our 2016 report. For example, last year 8.9% of survey respondents from our U.S. Engineering team self-reported as Black or African American. This year we’re reporting that 4.8% of U.S. Technical positions are held by Black or African American employees. We attribute this difference to the methodological changes: an apples-to-apples comparison results in 4.3% last year compared to the 4.8% in Technical positions reported this year. Future reports will be consistent with the new methodology. ² “URM” includes Black or African American, Hispanic or Latino, Native Hawaiian and Pacific Islander, and Native American. This is consistent with the standard that has evolved in other diversity reports. ³ Previously, we reported on Engineering and Technical departments separately; these groups are largely inclusive of one another, so we now report both combined in “Technical” only.